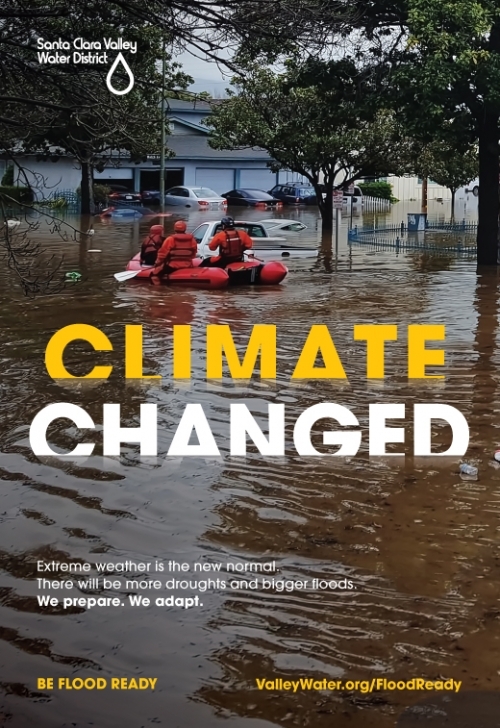 Better World Advertising (BWA) and the Santa Clara Valley Water District (SCVWD) continued their partnership with the Climate Changed campaign. The goal is to support SCVWD's flood awareness efforts to keep Santa Clara County (SCC) residents and businesses well-informed and prepared about the dangers of flooding. Individuals in areas prone to flooding were the primary audience. In an effort to reach SCC's more vulnerable populations BWA developed campaign materials in English, Spanish, Vietnamese, and Chinese. Campaign materials were disseminated through banner ads, social media posts, outdoor ads (light rail and transit shelters), and Pandora. Ads were also run in mainstream and ethnic print and radio media outlets that are relevant to the priority population.